Galen Tasker is chasing the terrorist who murdered his parents ten years ago. That killer is Halcyon, a Siren, a female Mer. The chase has brought him to the Complex, a daring new experiment in peaceful living, an end to war between Humans and Metas--an array of what appear to the reader to be genetically modified descendants of Humans. Humans and Metas, though, appear to believe they are unrelated. The many varieties of Metas that exist are an added complication for Meta-averse Humans, like Galen. Galen's an engineer, the new chief engineer of the newly completed Complex. He really, really wants to end the violence, and support the peace that the Complex is supposed to be the beginning of, but he doesn't see any contradiction between his desire to kill Halcyon, and his desire to end the violence. Once he arrives at the Complex, he meets one of his subordinates, Allie, a female engineer whom he assumes to be Human because he sees nothing Meta about her, despite her unusual beauty. Neither Galen nor Allie knows what they're headed for. 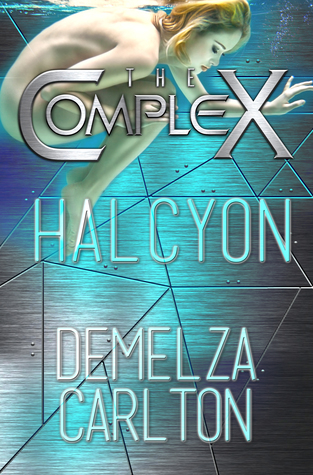 Galen is determined to find the sadistic killer, Halcyon. He knows she's headed here, to destroy the peace. That can't be Allie, because she's not Meta and she's certainly not Mer. Allie knows an agent of the terrorist organization Humans First is coming to the Complex to destroy it and destroy the peace. That can't be Galen, the very peaceful manwho wants an end to the violence, despite some discomfort with Metas. This is a novella, solidly written even though this is Carlton's first venture into science fiction and it shows in some clumsiness in handling some of those elements. It's a good introduction to Carlton's new Complex series. I received a free electronic galley of this book from the author and am reviewing it entirely by my own choice.